Powers/Abilities: The demon possessed sharp claws and fangs, which could rip through human flesh with ease. He had maws on both hands and at the end on his tentacles, which could protrude from all over his body. The demon ate souls, which he devoured by openening a vortex-creating gullet on his chest. He could wear a human corpse like a costume by compressing his true form in an almost liquid state. He could leave his disguise at any point. He possessed some mystical abilities (making walls bleed green ooze), which he retained while in human disguise. (Midnight Sons Unlimited#5 (fb) - BTS) - The demon from Hell heard about Johnny Blaze defeating Mephisto and it humored him. At some point the demon left Hell to go on a holiday on Earth. Arriving there he only wanted some comfort and a good meal (humans) until he returned to Hell. The demon slew Jessica Gole's parents in their Lancaster, Pennsylvania home and devoured their souls. (Midnight Sons Unlimited#5 (fb) ) - When Jessica arrived home after a late-night study session the demon slew her as well, but her spirit escaped him. (Midnight Sons Unlimited#5) - Accompanied by Johnny Blaze, the former Ghost Rider, Jessica's spirit returned home to face the demon. 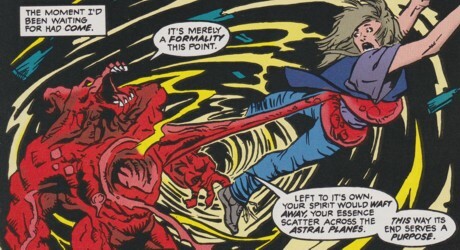 Wearing a human body like a costume the demon confronted Blaze and Jessica. He was glad to finally meet Blaze, the man whose actions against Mephisto had humored him so much in the past. Explaining his actions politely then made the walls ooze. Blaze called this a mere parlor trick, which the demon considered very impolite. The demon gave Blaze permission to leave, but Jessica, who had already been killed by the demon was going to become his next meal. 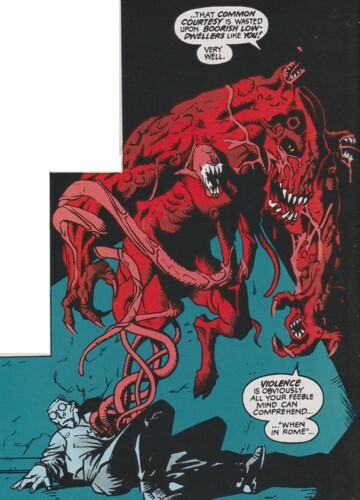 Blaze shot him with the Hellfire shotgun and the demon left the corpse through the wound to reveal his true form. Because violence seemed to be the only thing Blaze was capable off the demon responded in a similar matter. Hit bit Blaze's right metal arm (not very tasty) then got one of his fanged tentacles cut off by Blaze. After the demon threw Blaze through a railing the demon approached Jessica, but Blaze shot the floor beneath the demon's feet and it dropped to the ground level while Jessica held on to the railing. The demon offered Blaze one last chance to leave while pulling Jessica with another tentacle to his soul-devouring gullet. When her spirit form was right in front of his gullet Blaze shot through her with the Hellfire shotgun using her as conduit for the Hellfire to destroy the demon. Blown up by the hellfire the demon died while congratulated Blaze for his coldhearted actions of destroying Jessica's soul forever to get at the demon. Burned down to a heap of flesh the demon apparently died. Comments: Created by Tom Brevoort & Mike Kanterovich (writers), John Bridges (pencils), Max Douglas & Richard Pace (inks). The demon was never given a codename or real name in the story. It remained just an unidentified demon until it was destroyed. Jessica called it something "nameless" and "unspeakable" in the story while talking about the demon. The latter sounds kind of nice. A slain demon goes where? To Hell? The only thing Blaze prevented was the demon devouring Jessica's soul. (Midnight Sons Unlimited#5/2 (fb) - BTS) - Years ago when Jessica was still little she saw a ballerina on TV and decided to become one herself. Her dad paid for some dancing lessons and a tutu, but she was never a good dancer. Her Dad still wanted her to believe in her dreams and gifted her a ballerina statue. 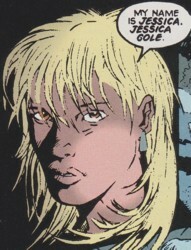 At some point her Dad took her to one of Johnny Blaze's stunt cyclist shows. Her Dad died and her mother remarried. Jessica Gole lived in Lancaster, Pennsylvania with her mother, her husband and her brother Jim. (Midnight Sons Unlimited#5/2 (fb) ) - Coming home from a late-night study session Jessica found her mother and her husband murdered at home. She was then attacked and slain by a demon, but her spirit escaped him before the demon could devour it. (Midnight Sons Unlimited#5/2) - Jessica was drawn to Johnny Blaze, the former Ghost Rider, and recognized him immediately though she wasn't sure why she came to him. After telling him of the attack at her house and her murdered parents and how she ran away through the darkness and eventually saw a light she was drawn to and that was how she ended up with Blaze. Believing her Blaze took Jessica back home to help her. Though she was scared she entered the house once again with Blaze at her side. Searching for the demon they happened upon Jessica's chaotic room (it was always that way) and she found her ballerina statue broken on the ground. They were approached by the demon, who was wearing a human disguise. The demon explained his actions and offered Blaze a chance to leave, but Jessica, who he had slain already, belonged to him. Blaze shot the demon, who left his human disguise and fought back. Jessica was scared stiff when the demon approached her, but Blaze destroyed the ground beneath the demon's feet with a hellfire shot. Jessica still held on to a damaged railing while the demon assaulted Blaze again. Getting a hold of Jessica with one of his tentacles the demon pulled her to his soul-devouring gullet, who explained that it was better for her to become his meal than to see her spirit scattered across the astral planes. When Jessica's spirit was in front of the demon's gullet Blaze shot through her using her spirit as conduit to get to the demon, which died. Jessica's soul was destroyed for all eternity, but Blaze knew that he had granted a dead girl's dying wish by destroying the demon with her help.